He was presented with the Award by Ms Zhang Rongming, the 10th and 11th Vice-Chairperson of the National Committee of the Chinese People’s Political Consultative Conference, in the presence of national leaders Mr Xu Bingjin, Mr Tao Xiping, Mr Qian Yicheng and Mr Sheng Jianxue at a special ceremony as part of the 2015 China Annual Conference for International Education. The National Rainbow Bridge Award, a special prize for promoting the friendly cooperation between Chinese people and people from other countries, is sponsored by professional associations on international cooperation in Mainland China and Hong Kong and overseas Chinese organisations. It will be awarded annually to an expert who has made outstanding contributions to cooperation in the fields of education, science and technology, and culture between China and countries around the world. Professor Lord Bhattacharyya, the first individual to be honoured with the Award, founded WMG in 1980 to help reinvigorate UK manufacturing. From its inception WMG’s mission has been to improve the competitiveness of organisations through the application of value adding innovation, new technologies and skills deployment, bringing academic rigour to industrial and organisational practice. Today it is a world-leading research and education group and one of the largest single organisations dealing in the multi-disciplinary facets of manufacturing developments. “It is a great personal pleasure and honour to receive the first Rainbow Bridge Award. The Rainbow Bridge of the famous Qingming Scroll is a magnificent artistic achievement. It is also, for me, a symbol of China’s great age of invention a millennia ago, when China led the world in engineering and innovation. On my very first visit to China in 1982, when I was advising UK Prime Minister, Margaret Thatcher, I realised the next great era of Chinese scientific and technological advance was emerging. To have played a role in this new age of Chinese innovation has been a stimulating and exciting part of my life for over thirty years and I’ve witnessed the leaps in innovation in Chinese technology in every field from astronautics to exoskeletons. China’s Research and Development Budget is now larger than all of Europe’s and soon China will be the world’s largest innovator. Together, we are creating a greener, lighter, smarter world economy. Together, we are building a bridge to a better tomorrow, a true rainbow bridge”. Professor Lord Bhattacharyya was previously appointed a CBE in 1997 and knighted in 2003. In 2004, he was made a life peer as Baron Bhattacharyya of Moseley in the County of the West Midlands. In 2014 he was elected to the Fellowship of The Royal Society for his contribution to engineering research and education and he has been awarded honorary doctorates by many universities worldwide. Professor Lord Bhattacharyya has published extensively in the field of manufacturing and he is an advisor to many companies and organisations around the world. He has advised United Kingdom (UK) and international governments on manufacturing, innovation and technology and has been instrumental in many large scale inward investments in the UK, most recently the Tata acquisition of Jaguar Land Rover. 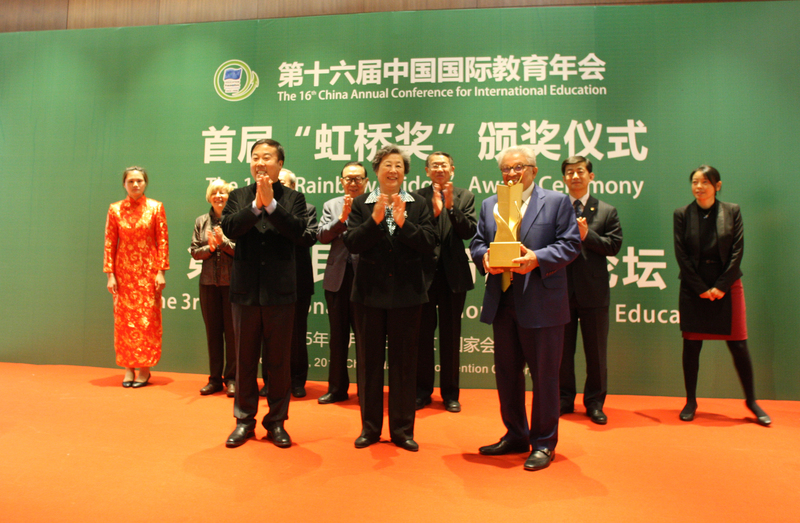 The National Rainbow Bridge Award has been awarded in recognition of the leading role that Professor Lord Bhattacharyya has played in the creation of strong and mutually beneficial technology partnerships between China and the UK. Over the three decades since he invited Dr Liang Sili, the father of Chinese Astronautics, to Britain to work with his WMG (Warwick Manufacturing Group) engineers, more than twenty thousand Chinese students, workers and scientists have benefitted from WMG programmes. Highly effective training and research partnerships have been created with some of China’s most innovative businesses and universities. Most recently the innovation partnership with Beijing City University which provides practically relevant, intensive advanced education to graduates and managers from Chinese enterprises, for example China Aerospace.